Jerwin ‘Pretty Boy’ Ancajas (30-1-1, 20 KO) beat challenger Jonas Sultan (14-4, 9 KOs) by a 12 round unanimous decision on Saturday night in a fight on Top Rank Boxing on ESPN from the Save Mart Arena in Fresno, California. The scores were 119-109, 119-109, and 117-111. The boxing fans at ringside seemed displeased with the performances from the two Filipino fighters, as they booed throughout the fight due to the lack of action. Top Rank promoter Bob Arum was hoping that this would be a thrilling one for the fans at the Save Mart Arena and the ones that watched it at home on ESPN+, but it turned out to be a disappointing affair with not a lot of action. Some of that was the fault of the challenger Sultan, who, often stood on the outside waiting for the right moment to lunge forward with a wild swing, which often missed. Sultan looked wild and not particularly skilled for a fighter ranked No.1 with the International Boxing Federation. Ancajas also played a part in the fight not being competing to watch, as he was constant to stay on the outside and counter punch most of the fight. Ancajas used his jab and single pot shot left hands to pound out a decision over his smaller opponent Jonas, who also comes from the Philippines. The fight was the first title fight between two Filipino fighters in 93 years since 1925. After the 10th round, the fans at ringside were booing loudly because neither fighter was doing anything to try and land meaningful punches. Ancajas was just waiting for Sultan to throw a shot so that he could throw a counter punch. For his part, Sultan was looking for openings in the guard of Ancajas before he’s lunge forward to throw a wild haymaker shot. Sultan’s face was pretty swollen up, especially around the eyes by the 11th round. At the end of the 11th, Sultan had a big lump in the middle of his forehead from a clash of heads that took place in the round. The clash of heads was initiated by Sultan with his lunging attacks. Overall, this was not the fight that many people in boxing thought it was. Sultan was too unskilled and too small to present any kind of challenge to the 5’6” Ancajas. It wasn’t so much the height that prevented Sultan from doing well. It was lack of punching power. Naoya Inoue is a little taller than Sultan, but he’s a devastating puncher and he would have been a nightmare for Ancajas if he’d been inside the ring. 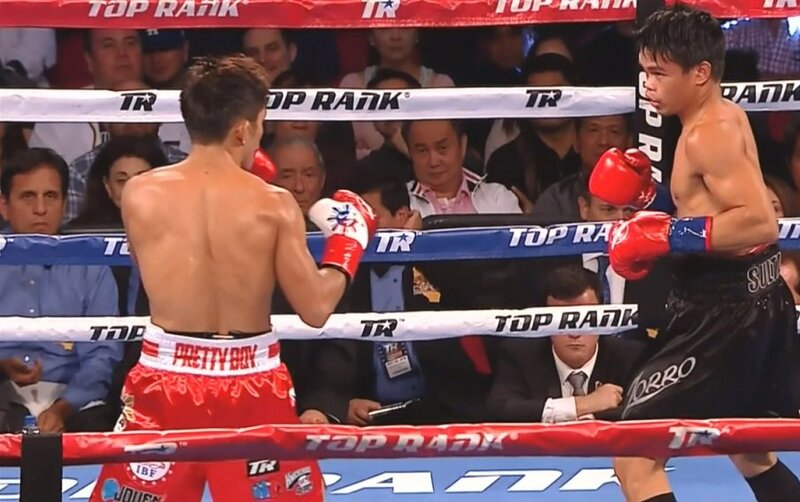 If Top Rank promoter Bob Arum is hoping that Ancajas will turn into the next Manny Pacquiao for his him, I’m afraid he’s going to be greatly disappointed. Ancajas is not that type of fighter and he never will be. Ancajas is a more conservative fighter, who doesn’t take chances, and does just the minimum needed to win his fights. The real show-stealer for tonight’ card was WBA super flyweight champion Khalid Yafai with his 7th round stoppage win over David Carmona in the co-feature. Yafai put in a much better performance than Ancajas, even though he was given credit for three bogus knockdowns in the fight. When Yafai wasn’t hitting Carmona low and knocking him down, he was looking good.